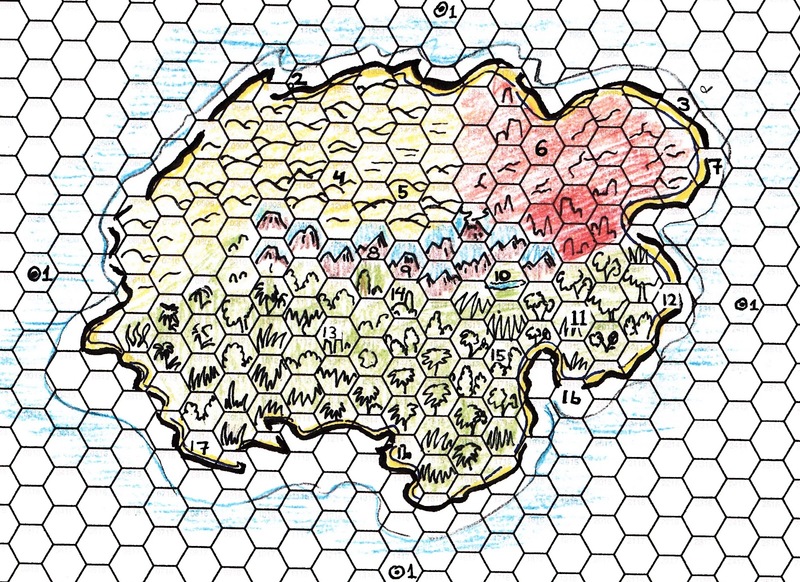 Force field Generator (FFG): nearly large enough to be islands themselves, spaced at the cardinal points of the compass, four of these huge mechanisms gird the island,. They cannot be shut down from the island, but can be destroyed. Destruction of any two will bring down the barrier that surrounds the island to come down. Destruction requites two massive successes, or the equivalent (using success pyramid rules). The devices are self repairing, therefore all relevant success must be accomplished during the same combat page (round). Outpost one: abandon X Force X facility. Small cement building, broken windows, scattered papers. Two electric mini-trucks outside. Entry point: this is the beach where the PCs wake upon arriving at the island on Day 0. This battlefield is two days old on Day 0. It is covered with the cream of XFX. Lots of crushed and blasted mechs and dead pilots. A few with their heads exploded (evidence of Mindwarp). The Obelisk: A horrible alien thing, placed on island X, because it is too awful to put anywhere else. Has an aura which drains 4 stamina/round.Cannot be destroyed. Central Control airplane with garbled message from one of the PCs recorded in the past (if you decide to forgo the time-travel aspect it could be a message from some other party). this is essentially an info dump opportunity. The GM should decide exactly how badly garbled the message is and how much information to give the PCs at this point. XFX HQ (Detailed in a forthcoming post). A wide, oval lake dominates this area. A large section of the lake is covered by the honey comb-like structure of the magunuera hive. This is where the creature’s larva gestate and swarm. At any time there can be up to 10 of them in the vicinity of the hive. They look like horse sized dragonflies.The landscape around within a fifteen-minute walk is blasted and brown in every direction. The larva have stripped it bare.they are very aggressive and will attack if they see the PCs. Village of the Beast men: The village consists of a 25 tree-houses. There is a large shrine to Rangor the mad god-king of the beast men situated at the center of the village. There are roughly 40 adults and 20 children living in the village. Everyone has the body of a human but the head and hide of a beast. Each of them also have an additional randomly determined power. Meat Station: The meat station consists of a huge aluminum reception pad and a blockhouse. Twice a day 30 tons of synthetic meat materializes on the pad. Previously, XFX saw to it the meat was distributed around the island, but for the last two days the meat has appeared and rotted in the sun. Meat stops arriving in the evening of Day 2. The Shrine: a large spire of amber rock juts from the jungle here. No vegetation grows on the stone it is completely clean. Starting from the peaked top of the formation, and covering its sides thousands of hieroglyphics are inscribed upon the entire stone. The inscription is but one line arranged in a tight spiral. The rock glows gently at night. The mouth of the Time Tunnel lies a short distance to south. If the characters enter the tunnel they will arrive back in their own time, minutes after they left. XFX Bunker. There is a hidden bunker in this Hex. There are 6 XFX operatives alive. Four of them are healthy the other two badly injured. One of them speaks English but he is in a coma. They have two working battle Mechs and a stun platform. Wrecked Central Control submarine. 10 fish-chewed corpses. Outpost 3. Abandoned cement blockhouse, stripped of all resources. We finished up with Island X on Saturday in one of our semi-annual face to face marathon sessions. I have everything more or less detailed, but I need to ink the maps and type up the bestiary. I'm guessing I'll have the whole thing done in a couple more posts and then I'll make a pdf maybe. The campaign is in its final phase, which is good, because I'm getting a bit tired of supers, and I want to focus on Metal Earth and my stupid novel. 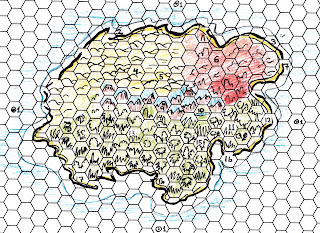 Edit: I didn't key all the hexes because I thought the job would be better served by encounter/event tables (which I also need to type up). What should be on the Character sheet? This weekend while playing ICONS we spent a few minutes page flipping. As with the simpler forms of D&D, this is hardly ever necessary with ICONS, but it seems when the need does arise, we are always looking up the same things- the particular rules surrounding a particular superpower. In my experience with D&D, this same sort of thing goes on with spells. So anyway, I'm going to put a column for page numbers in the spells/advantages section of the Metal Earth* character sheet. Its hardly a world changing innovation, I know, but I think it will speed play A LOT. Keeping in mind this is a simple D&D variant with a modified combat system, what else needs to be on the character sheet. *For the seven of you who are drunk enough to care, the first draft is effectively 100% done, although some stuff needs to be integrated into the main document, most everything has been written at least in draft form. Unsurprisingly, the draft is 100% unfit for human consumption at the current date. [B/X] Justify the slow progression of the Elf for me- if you can. That's it. Looking at this and that, it seems to me that the B/X Elf gets hosed; even if we account for the extra abilities, it seems like the xp/lvl costs are close to twice what they should be. If any one has a solid explanation for this I'd love to hear it. SW WB is even more skewed, btw, but Holmes seems to be more in line with my thinking- unless I'm reading him wrong. I don't have access to the LBB's but talk about that stuff all you want in the comments. This all has relevance to the stupid game I'm writing for the stupid setting I've already created.